When you’re in the second half of life, everything looks different, and your career is no exception. Did you miss the path to a really satisfying career? Is it too late to change? And what do you do about money in the meantime? The world is changing fast. Whole industries are being disrupted by technology, globalization is changing the boundaries of the workplace and nobody s sure what skills will be important tomorrow. If you’re in the second half of life, you’re experiencing your own shifts and upheavals, finding as we all do that things aren’t as we thought they would be when we hit our 40s and beyond. You need a strategy to figure out where to go from here. 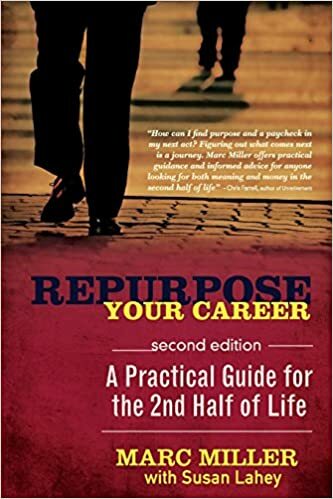 Repurpose Your Career: A Practical Guide for the Second Half of Life provides that strategy. Career design expert Marc Miller helps you repurpose your old career, using the experience you’ve gained so far to make practical pivots into a new career. He teaches you to identify what you, uniquely, need for a happy work life in the long term. He gives specific advice on knowing yourself, building a tribe, networking strategically, using social media and interviewing successfully. Topical book for everyone entering the 2nd half of life. Marc Miller’s career journey included 22 years at IBM, several thriving tech startups, a painful stint as a high school teacher, a gig raising funds for the Jewish Community Association of Austin and a near fatal bicycle accident that changed his perspective forever. Thirty years of wandering the proverbial career desert, often repeating the same mistakes over and over, taught him his most crucial lesson: Most people don’t really know what makes them happy at their core, what fulfils them. They pursue money, status, a skill set, all of which provide some level of satisfaction, but not contentment. They wind up feeling frustrated and trapped. Others have figured out what they need, but don’t know how to chart a course to get there. An active member of the Launch Pad Job Club, Marc found himself counselling friends and associates on their career journeys and finally realized he’d found his vocation. He would use his extensive training experience to help others—especially Baby Boomers—find careers that they could grow into for the decades that lie ahead. Marc is passionate about his work and the clients he serves. He’s taught in more than 35 countries and helped clients from many industries. This entry was posted in Uncategorized and tagged marc miller, repurpose your career, susan lahey. Bookmark the permalink.